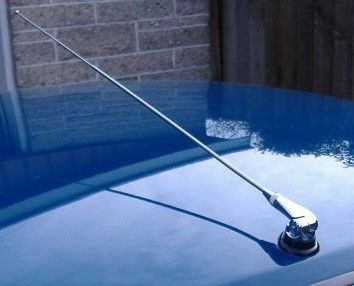 HIGHEST QUALITY NEW CLASSIC CAR CHROME MASTED ROOF AERIAL / ANTENNA. WITH ADJUSTABLE ANGLE AND TWO PIECE TELESCOPE. COMPLETE WITH O RING GASKET AND COAXIAL CABLE. The pivot casting is chrome plated and the removable mast is a two section telescope, measuring approximately 42 cm overall when retracted and 68 cm when extended. The base requires one 10 mm mounting hole, with a smaller 5 mm hole behind to accept a locating peg (although this smaller hole is not essential is you wish to remove the locating peg). The mast can be adjusted to any angle 0° to 90° to match the line of the windscreen, a preferred rake, or achieve optimum signal strength.